League of Legends Patch 9.6 arrives Wednesday, bringing five new skins to the game. Fizz, Corki, Yorick and Rengar will all receive new skins tied to the new League of Legends VS event. As this event's theme pits dogs against cats, each skin plays into that dichotomy for comedic effect. 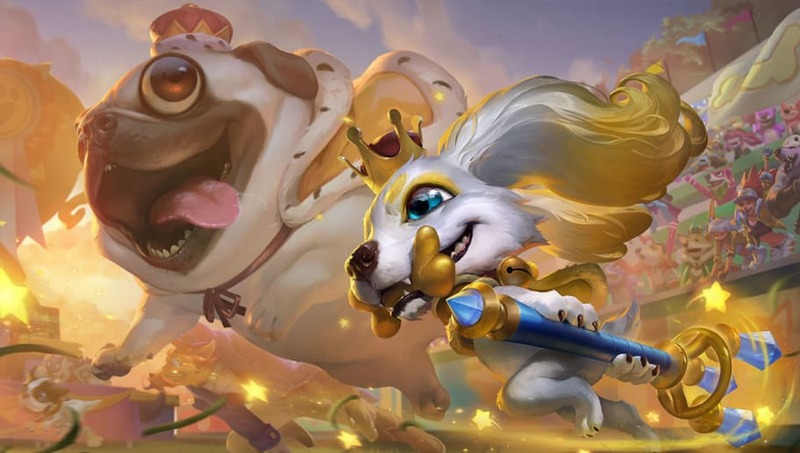 Fuzz Fizz turns Fizz into a floppy-eared canine, Corgi Corki replaces the Yordle'e ship with a flying corgi, and Meowrick and Pretty Kitty Rengar put the two imposing champions in decidedly less imposing kitty pajamas. Fuzz Fizz will also receive a prestige edition, turning each of the skin's accents gold. Check out the splash art for each skin below. The four skins arrive in League of Legends alongside balance changes for several heroes, changes to creep score bounties, and the removal of positional rank from the League of Legends ladder.